The cat ... was purrfect. How do you make your own decals? can you just get paper to print them on? I really like the idea. Never thought about it. I really like those models, I don't know what the obsession GW had with tassels on spears but I feel like nearly every fantasy army had that look! Ja, you can get decal paper. And with the quality of home printers these days they come out pretty nice. If you use an ink jet printer there is also a sealer that you need to put over them, after they dry for about 8 hours. It ends up being over a day before I confident to put them in water. Since these were going on a flat surface I probably could have just used a clear acrylic spray. It seems the process is much better on a laser printer. The words of a serious hobbyist. Works very well I feel Shannar. The cat came with a female vampire. 5th Edition I fancy. Neferata? Well, it's gone to the next level of serious. I've 99% convinced myself to pick up a 3D printer. It's another hobby to learn I think, but done right it will support this one well. I was pretty pleased with the banner. It works well to represent Lothern, and the sea dragon ties it into the rest of the army without looking out of place. And I was forced to brush up on my photoshop. It's always good to do that before the skills are completely gone. Thanks for the info on the decal paper. I've only got a regular ink jet printer at home. So getting some sealer is the way to go there. But it does give some nice options to get fancier banners etc done. The 3D printer is a nice idea. They're getting better and cheaper as time moves forward. Especially if it's mainly models you want to print then a small one would be good enough. And they are priced such that they pay themselves back after a handful of models I think. The tricky part probably is finding the printing templates (whatever they're called). Have you had many games of this Shannar? Always liked the look of it, I’m a sucker for the smaller scales. 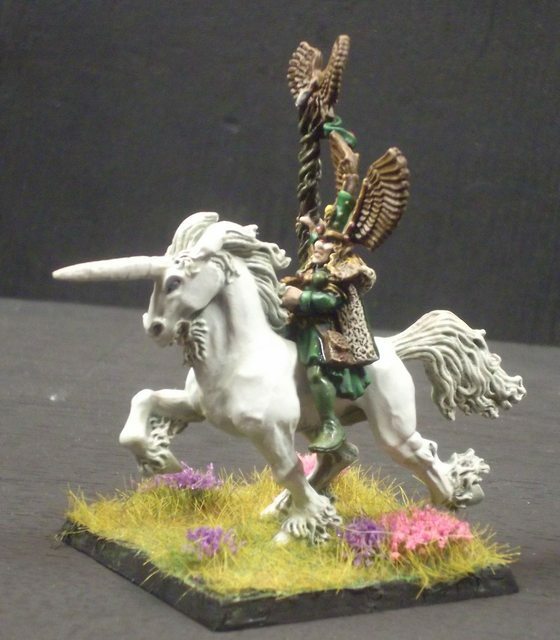 The High Elves looked great too. Maybe 5 games in my life. But it's a really good game. Last year I found a heck of deal on a HE army and simply could not pass on it. Can you still find the rules for it somewhere? Of is that mainly a case of hunting around ebay for an elusive rule book? Unless you speak French your best bet is to google Warmaster Revolutions. It's an updated (free) ruleset, with some of the changes that Warmaster Historical brought in. It's really good, and pretty much the standard ruleset in use. The French seem to have done that first, and stuck with their own very similar ruleset. First, the Sea Elf army is complete. This is over 2000pts, but gives me room to play around a bit. I forgot to do a tray for the scouts. And I need to do two archers, but I'm waiting to find #21 in the MM81 range so I can paint them at the same time. Second, this 10mm stuff is for the birds. Actually the eagles were pretty fun, but the spears and archers I'm working on now are a challenge. 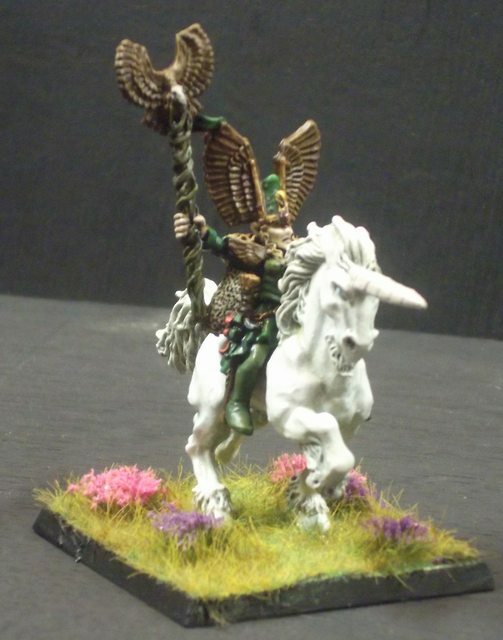 I finished a marauder unicorn, and the rider is almost done, as a break from the tiny stuff. I think I'll have to mix in some of my 28mm Elf heroes and the like just to keep from getting to frustrated with the tiny stuff. That's a nice looking army. Fun to see how the size of a Warhammer army has increased through the years. An 8th ed. 2000pts army is probably 2 - 2.5 times the number of models. The eagles are nice as well. You've gotten a lot of details in there for such a tiny size. Compared to the MoW eagles these are giant haha. I'm also working on one of these with a rider. The hard part about 10mm is sometimes the sculpts are just good enough that I feel the need to paint the eyes. Sometimes they aren't. So do I paint the eyes? I decided yes on heros, archers, and the front rank of the spearmen. It's hard on the bolt thrower. One of the crew it's a yes, the others you can't really find the eyes to paint them. First, the Sea Elf army is complete. I feel the need to paint the eyes. You sir, are far too dedicated! The people who are far to dedicated are the ones who have more than one painted army at 10mm. I was really thinking I'd like to add Goblins, and maybe Empire. I've changed my mind. I think it'll be really cool when these are done. Right now I have no desire to repeat the process (and a lot of units to go). If someone was crazy enough to try to sculpt them I should try to be crazy enough to paint them. Where the sculptor succeeded I mostly did as well. Though when I look at them without the magnifier I use when painting I wonder why I bothered They are coming along pretty well. Still tons to do, so I'm not going to guess when they will be finished. The warmaster stuff is progressing well. I'm almost done with a hero on eagle, and I'm rather pleased with it. The rank and file are slower, but coming along well. But, I did have to finish this. The 4 year old was offering her advice. "No rocks, or he will trip" And "lots of flowers, but only pink, and purple is ok too." I’m surprised she didn’t get you to paint him rainbow-coloured. The 5th edition unarmored archers are coming along well. I'd guess they'll be finished (at least ready to base) by next weekend. We had a plog a while back (I think it was by Ptolomy) where he let his kid pick the colors for his army. It ended up a riot of pinks and purples indeed. But it somehow worked. I realized that my Merchant Company didn't have their mascot yet. It's good, one less wood elf required for that unit now, and the HE will finish it up when I find it. 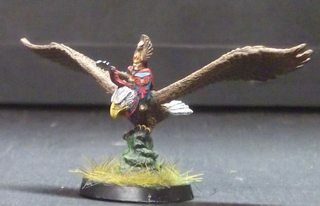 My warmaster "army" now has a hero to lead the eagles. The next unit I plan to start is a bit of a change of pace. And maybe a small mistake. Unless I move the line to far (it was intended to be pre92- not a mistake, but I think I've gone up to 95. I got a steal on some 6e ones too, but the look is different enough that I think I'll be able to sell those on without regret). On a related note, if anyone is looking for 6th edition wood elf heros let me know. Love how the bottom right archer is aiming at the ground like "I see you there, ant. You won't steal my sugary treats again!" EDIT: BTW, how did you do the bowstrings? Are they also painted, or au naturel? Bowstrings are thread, knots, and a bit of superglue. I really like the old minis. They may lack some of the "detail" of they newer stuff, but they also don't have tons of extra junk all over. They also have a ton of character that I think most of the newer ones lack. Of course both the older and the newer have great minis and real bad ones as well. and that archer has his arrow on the wrong side of the bow. It's sculpted that way, not one that I added. It's a weird one for sure. I thought it was Gollum at first! Croum decided to become a Shadow Warrior. As an Eternal Champion, he’s probably ready for the Long War. Haha glad I can help. There should be some more 80s goodness coming. It's a unit of 20, and I still have to strip a few, so it might be a month of so off.